Your children will thank you later. It's never too early to introduce your children to basic concepts of investing. One great way to do so is to buy stocks to familiarize them with the process and teach important investing lessons at a young age. To help you find high-quality companies worthy of both their interest and a place in their portfolio, we asked three Motley Fool contributors to each pick a stock investors would do well to buy for their kids. Here's why they like Under Armour (NYSE:UA)(NYSE:UAA), Walt Disney (NYSE:DIS), and Tencent (NASDAQOTH:TCEHY). Steve Symington (Under Armour): Judging by the way Under Armour stock plunged last week after the company unveiled its new long-term strategic plan, you'd think there was something seriously wrong with the athletic apparel and footwear specialist's goals. To the contrary, Under Armour outlined targets for a return to double-digit growth by 2023, including a mid- to high single-digit compound annual growth rate between now and then led by its burgeoning international and direct-to-consumer businesses. In the meantime, its core North American business is expected to deliver low single-digit annual growth. So what gives? One Wall Street analyst summed it up nicely when he downgraded the stock on Wednesday in response, noting that Under Armour is "taking a more disciplined approach to growth, which will support the health of the brand but will also result in slower growth than previously expected." But I think that's a great lesson for young investors today. Whether Wall Street likes it or not, sometimes you need to do the right thing -- which in Under Armour's case is not recklessly chasing growth simply for the sake of growing -- in order to ensure a healthier business over the long run. With shares now nearly 30% below their 52-week high -- and with its current market cap of less than $8 billion, or under one-tenth the size of Nike -- your kids can also experience the thrill of watching an underdog fight to take market share and create shareholder value for years to come. Reuben Gregg Brewer (Walt Disney): If you are looking for a stock that your children will be interested in, look no further than Disney. This entertainment giant is a great pick for young kids (Mickey Mouse) to old (ESPN), and every age in between (Star Wars, Marvel, and more). Equally important, Disney is taking the steps necessary to ensure it remains atop the media industry for years to come. That includes the high-profile purchase of most of Twenty-First Century Fox (NASDAQ:FOX)(NASDAQ:FOXA) for around $71 billion. But that's really just one piece of the puzzle. Yes, the deal brings a host of new media properties for Disney to exploit, like the Simpsons and Avatar, but Disney has been building its portfolio for years. That includes the purchase of Marvel and Lucas Films, which helped reinvigorate the company's movie business. Assets like these, however, are bigger inside Disney than they would be in other companies because Disney can use them to boost its theme parks and support the next big industry push -- direct to consumer streaming services. ESPN's direct to consumer product is just the start, with a more traditional media service set to launch soon. Adding Fox's content to what Disney already owns will put material muscle behind this offering. 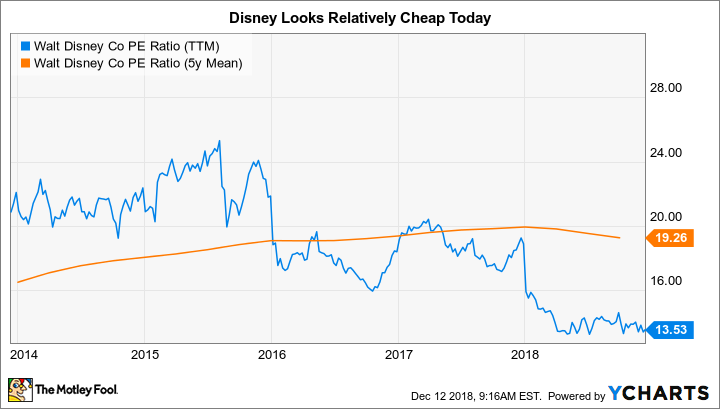 That backstory is pretty exciting, but what makes Disney particularly interesting today is its valuation. The company's P/E, P/C, P/B, P/S, and PEG ratios are all below their five-year averages. And while the company's 1.5% yield is kind of miserly, it's actually high by historical standards. "Kid" favorite Disney is definitely worth a close look today. Leo Sun (Tencent): Tencent isn't a household name in America, but the Chinese tech giant makes many of your kids' favorite video games. Its subsidiary Riot Games created the esports favorite League of Legends. It owns Supercell, which makes the hit mobile game Clash of Clans, and major stakes in Epic Games and Bluehole -- which publish the popular battle royale games Fortnite and PUBG, respectively. Its popular mobile game Arena of Valor is also a repackaged version of its blockbuster Chinese title Honor of Kings. However, Tencent hit a speed bump this year when the Chinese government temporarily froze all new gaming approvals. That decision torpedoed Tencent's stock, since roughly a third of its revenue came from online games. However, Tencent's social networking business continues to flourish as WeChat, the top mobile messaging app in China with 1.08 billion monthly active users, continues to evolve into an all-in-one platform with "mini programs" for online purchases and other services. Its streaming ecosystem is expanding as Tencent Video and Tencent Music (NYSE:TME) lock in more subscribers, and its ad revenue continues to climb. Its cloud and payment services are also rapidly growing. The growth of those businesses offset the weakness of its gaming business last quarter. Simply put, Tencent remains a solid long-term investment on China's booming tech market, despite the gaming freeze and near-term trade tensions. Your kids will have plenty of time to ride out those headwinds to profit from the growth of one of the biggest gaming and social networking companies in the world. Of course, nobody can guarantee that these three stocks will go on to beat the broader market from here. But between Under Armour's disciplined growth strategy, Disney's incredible entertainment-asset portfolio and attractive valuation, and Tencent's temporary pullback on regulatory and trade-tension challenges -- as well as their respective abilities to command the attention of youthful investors -- our three Fool contributors think they'll offer satisfactory returns for any investor who buys now.